What telemarketers can and cannot do! Stop those telemarketing calls! TEMPE, AZ — Ever get a call you didn't want? Jay Karl says he did too and is doing something about it. 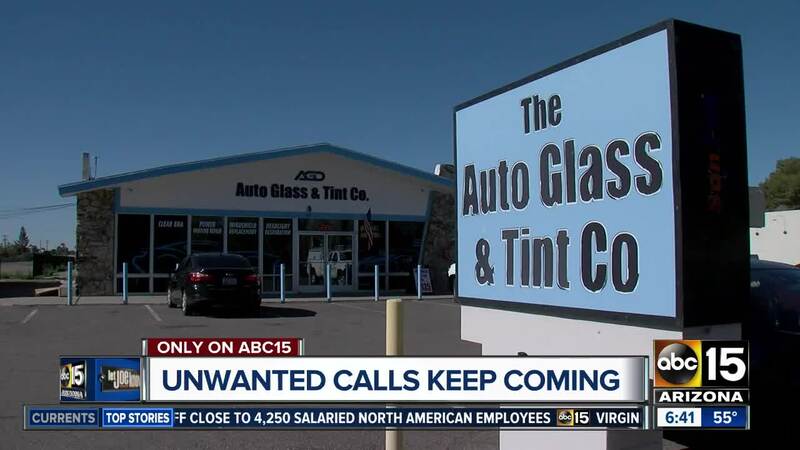 Back in 2015, Jay says he was a customer of Auto Glass and Tint Direct in Tempe. He says he didn't have a good experience, got a refund, and told them he didn't want them to call him. Jay says he blocked their numbers and kept his same phone number. But somehow calls got through, including one a few months ago. That's when he let me know. We tried getting ahold of the business but did not get any return calls. So we went to their Tempe address and to his credit, owner Chris Fill answered my questions. Fill says he believed Jay's name had been taken off any call list. And he says he does not call people on the Do Not Call Registry. But Fill says he uses an auto-dialed system to make calls. By law, those calls are not permitted without prior written permission. Fill also brought up the fact that Jay was a customer. A prior business relationship does allow businesses to call customers up to 18 months. But that is for live calls only. Any pre-recorded calls OR auto-dialed calls are still not permitted without consent. I sent the rules to owner Chris Fill. He didn't admit to doing anything wrong. But he says he'd look into it and if there was a glitch in the system, it would be addressed. Click here to learn more about your telemarketer call rights.